As the sporting world watches the 2014 Commonwealth Games in Glasgow to see which country will climb to the top of the medals table, WebRoots has created another medals table based on (you guessed it) election turnouts. 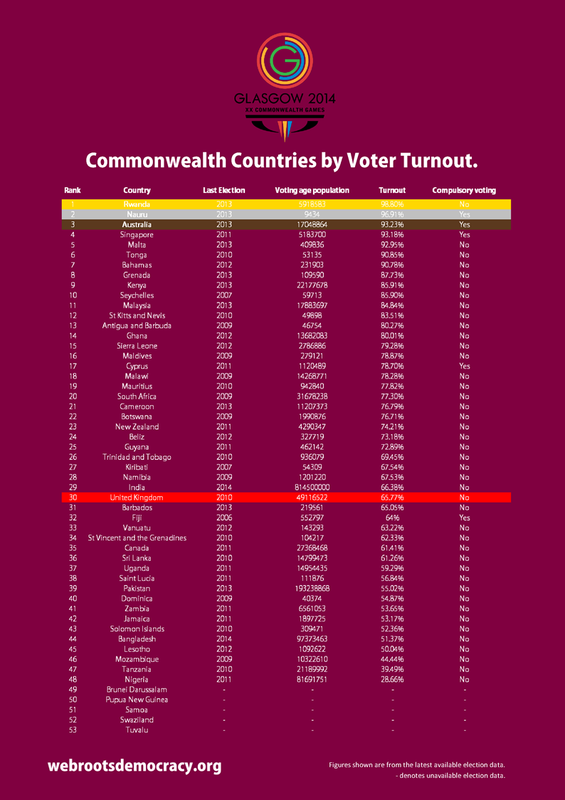 Rwanda tops the table with a 98.8% turnout in their last election, followed by Nauru, Australia, Singapore and Malta. At the bottom of the table are Mozambique (44.44%), Tanzania (39.39%), and Nigeria (28.66%). The UK is 30th in the table (65.77%), just behind India but slightly ahead of Barbados. Click on the image to view it in a larger size.